Fresh locally-grown produce can be found at many farmers markets in and around Baltimore, including the city’s largest market under the JFX Viaduct at Saratoga Street between Holliday and Gay Streets, open 7 a.m. – noon, April through December. Visit the markets on Charles Street, in Druid Hill Park, in Fells Point and at Cylburn. 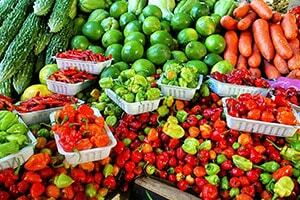 Click here for a complete list of area farmers markets.